A one-room school was built on the east side of the Kootenay River, in an area known as Shoreacres in 1915. In 1928, a second room was added and enrollment grew to 54 pupils. Unfortunately, in 1938 the original school was burned down and it students were then transferred to the Glade School. The settlement of Waterloo was located at the south end of Ootischenia. The school, a small one room building, was built in 1897 complete with homemade furnishings, 12 pupils attended. The school closed in 1900 when mining activity in the area ceased. This school first opened its doors for pupils in Castlegar in 1961. This new four room school plus activity room was built primarily to accommodate the children of the employees of the recently completed Celgar Pulp Mill. The 120 students, grades 1 to 5, were very excited to attend this new school. In 1965, two classrooms and a library were added. In subsequent years, kindergarten and individual progress classes were included. The school was closed and sold to a developer and was completely destroyed by fire. This school originally had four primary classes. Two rooms were added in the early 1960s. Additional classrooms were constructed over the years. Twin Rivers School housed only elementary intermediate grades and was a feeder school for Kinnaird Junior Secondary (Middle) School. In 1908, a two room school opened to serve pupils in the Thrums-Tarrys area. The school’s enrollment was 21 pupils. This old wooden structure was used until about 1947. During 1948 – 49 a new school was built on the present Tarrys School site. However, this school succumbed to fire. Several years went by before the school was rebuilt. The old Thrums two room school was hauled to the site of the burned a building and was refurbished and served as a school for six years. The first weekday school in Robson was held in a church building. The first school building was opened on August 31, 1908. The school had two classrooms, an activity room, office and a staff room. In 1964, Robson School registered a total of 224 students from grades 1 to 7. In 1983, the school took on a new look with the addition of two classrooms, a library, a new staff room, a medical room, a learning assistance room and an expanded office. At that time the old, two room school was finally dismantled. This school was located in the Pass Creek Valley. In the 1930s, the Doukhobors built this historic schoolhouse with bricks and lumber they produced by themselves. More than 100 students of the Castlegar district received the foundations of their secondary schooling in this uniquely Russian styled the building. The school closed in 1951 but occasionally was reopened if there were too many students for Robson Elementary. The school was eventually sold and converted to a restaurant. It is now a private residence. No one really knows when the first school was built in Pass Creek, however in the 1930s a regular school with a teacherage was built on what is now lot 38. In 1942, a new school was built on the lot number two, North Pass Creek by Kinney Creek. This school burned down because of a faulty chimney or stove in 1947. In 1948, another two room building with an attached teacherage was built. This school was closed in 1972. In 1972, a new four room school was on lot five, South Pass Creek. In 1975, an activity room and a kindergarten classroom were added. Classes from kindergarten to grade 7 were held in this school. The school was closed in 1985 and is now a store and storage facility. The small, brown shingled building located on Columbia Road, Ootischenia, just off the junction of Highway 3A, is the original school. In 1942, a school was built with three classrooms plus a teacherage under one roof. The school enrolled students from grades 1 to 8 in three classrooms. This school remained in operation until 1962. In 1963, a new school was built and the old building was purchased by the Ootischenia Doukhobor community and it now serves the community as a meeting hall. The new school consisted of two classrooms and the staff room. In 1978 there were major additions to the school such as a library, a gymnasium, new offices, storage rooms and a janitor’s room. The school board closed the school in 1986. This community can be reached across the Kootenay River by ferry only. The first school was established in the community in 1917 and was made from brick. However it was victim of fire. 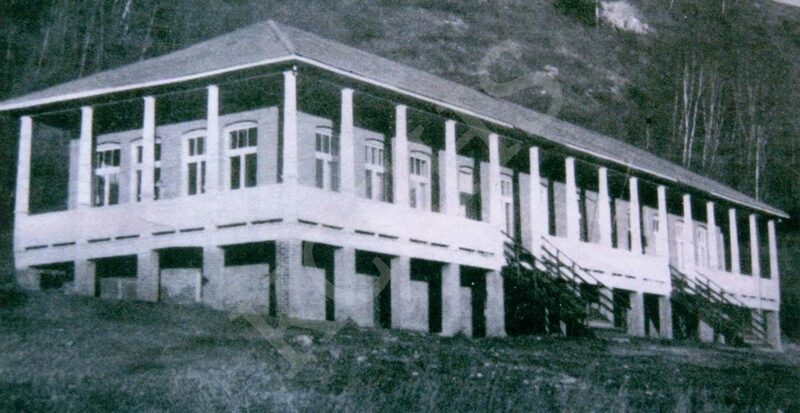 In 1933, a new school was built. This school had one classroom at each end of the building, and a four room teacherage. The building itself was more luxurious than many other schools in the area. Unfortunately it burned down in 1937. In 1938 an old brick building which once was a store was used as the school. Champion Creek is situated 8 miles south of Castlegar on the east side of the Columbia River, A Doukhobor community consisting of five villages located one quarter of a mile apart was established here. The school was established in 1922 and was located in a meeting room furnished with long desks and benches seating five or six pupils. The student body of consisted anywhere from 15 to 36 pupils. This school closed in 1958.